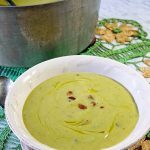 This Cream of Asparagus Soup Recipe screams springtime with tender, fresh asparagus. Roasting the asparagus gives it another layer of flavor. This asparagus soup recipe will soon become a family favorite. It's an easy delicious soup! Start by roasting the asparagus - snap off the woody ends and reserve for vegetable stock or another use. Lay the asparagus spears on a cookie sheet and drizzle with 2 tablespoons olive oil, sprinkle with salt & pepper. Put in the preheated oven for 15 minute. Remove from oven, allow to cool. When cool, cut into 1/4" pieces. While the asparagus is cooking, brown the bacon in a large stockpot over medium heat. Remove when crispy, reserving the drippings. Next, add the potatoes, onions, celery and Parmesan cheese rind (if using shredded parmesan add this after adding the stock) and season with black pepper. Cook the vegetables for about 5 minutes, they will be slightly browned. Add in the stock and about 3/4 of the chopped asparagus. (Reserve adding salt and remaining asparagus until the end of the cooking process.) Increase the heat and bring it to a boil. Reduce it to a simmer and continue cooking until the potatoes are fork tender, about 15 minutes. Turn off the heat. Remove the remains of the Parmesan rind (it's job is done!) If you're using shredded parmesan, add it now and stir until incorporated. Using a submersion or stand blender, blend the soup until it is creamy. When the consistency is to your liking, taste & adjust seasonings, add salt if needed. Garnish with reserved asparagus and bacon crumbles. A drizzle of good olive oil adds so much flavor!